Upcoming adventures: check out our Get Out! Have Fun! page to see upcoming adventures! Element Sports is proud to offer guided tours in the greater Shenandoah area! We love adventure, so we have developed a full range of adventures for you to enjoy. Our experience with the local roads and trails, combined with our dedicated and flexible team mean that we are able to offer fully-custom adventures! We want your experience to be unique and one-of-a-kind; our tours focus around you and not what we want to push on you. When you sign on for a tour with us, we will work with you to design the adventure around your goals, fitness level, and experience. Easy, hard, relaxed, aggressive — it’s your tour! Most of our tours include at least one meal, and we partner with local caterers to provide delicious and nutritious food that will sustain you for the adventure. Not only will the adventure be unique, but the food will be as well. We can accommodate those with food allergies, just be sure to let us know. We are also happy to provide extra services to help expedite your trip. Need to ship your bike ahead? No problem, ship it to our shop and we’ll have the bike assembled for you when you get here. We can also pack it back up and ship it out for you. * Don’t have a bike? We offer rentals at a discounted rate for those taking a cycling adventure with us. We also are happy to work with schools and church groups at discounted rates. Call for details. We also offering pre-planned tours and adventures. Check out our Get Out! Have Fun! page to see upcoming adventures and register! All of our tours feature a professional local guide who knows the area and the routes and will make your trip the adventure of a lifetime. Our guides are also trained in first aid and CPR. Our cycling tours will also feature a mechanic with basic items to cover mechanicals (flats, etc). Should a larger malfunction occur, we will take your bike back to the shop for service or can provide a rental at a discounted price. We are also excited to share some of the best hiking and camping in the world! We have thousands of miles of hiking trails in the Shenandoah valley, not even counting the several hundred miles of the famous Appalachian Trail. We will be glad to help you create awesome hikes that will take in some of the majestic views of the Blue Ridge. Our guides will be happy to take you on short day hikes that will accommodate anyone of any ability to demanding hikes for only the sturdiest of hikers. Want to hike for a weekend or even a whole week? We’re happy to take you on a backpacking adventure that will give you memories for a lifetime. Just like our cycling adventures, our hiking and camping trips are custom-tailored to your needs and desires. Want to tour on your own, but not sure what would be good routes? We can help you there, too! We will design custom routes for you based on your location, desired type of ride, length, difficulty, elevation gain, etc. We will provide you with cue sheets and a GPS file so you can use your phone or cyclocomputer to navigate. We will even make note of important features along the route, like stores, historical landmarks, etc. $40 per route. Whether you want to challenge yourself with some epic mountain biking, or leisurely cruise rail-trails, we offer tours that will provide a superb experience. Our tours are custom-made to your specifications. We will design the ride to be as long or short, as challenging or as easy as you like. We are also flexible, so we can alter the route day-of if necessary. We want to make sure you are getting the most out of your adventure! Our Day/Multi-Day Adventures can be designed around road cycling, mountain biking, gravel roads, and rail-trails. We’re even happy to design it around any combination of riding styles! Our adventures include a guide, and can include lunch, snacks, and drinks. Most of our Multi-Day Adventures are designed around a central location, which can be our shop, a hotel, a campground or almost any location. We are happy to design Multi-Day Adventures that are linear in nature, that is, include stays in hotels along the way. While we would be happy to make the arrangements for such trips, our prices listed do not reflect the cost of overnight accommodations. Call for pricing, as options requested will determine price. $75 to have a bicycle assembled and tuned, then disassembled and packaged after the tour. We can also post it FedEx for you, and we’ll charge the same rate FedEx charges us. Prices include lunch and snacks, but do not include rentals or other meals. See our rentals page to reserve a bike for your trip (or you can arrange when you call). Rentals will be provided at a 25% discount from the standard rental rate for those taking a tour with us. Our Bikamping Adventures inluded a guide, at least one meal per day and a tent. Sleeping gear is not provided. A packing list will be provided to you prior to the trip. For meals other than those provided, arrangements will be made to stop for meals. Gear will be carried with us on the bikes, so you will need to make sure your bike is capable of carrying what you need. Alternatively, we can transport gear for an extra fee. For an extra fee, gear will be transported to/from camping spots by vehicle so it does not have to carried on the bikes. Prices do not include rentals. See our rentals page to reserve a bike for your trip (or you can arrange when you call). Rentals will be provided at a 25% discount from the standard rental rate for those taking a tour with us. We are blessed with some great wineries, vineyards, and farmers markets in the Shenandoah area! These custom tours will make for a great day of riding and relaxation. We will customize the tour based on the amount of riding you would like to do, coupled with how many wineries, vineyards, or farmers markets you would like to visit. Prices will include tastings and one bottle of wine. Purchases made at farmers markets will be brought back by vehicle for you. Call for pricing, as each trip will need to be custom made for your group. Enjoy a hike to a natural waterslide or a weeklong trip hiking the Appalachian Trail. Just like our cycling adventures, our hikes and camping trips are custom-tailored to your needs and desires. Day hikes will include a guide and can include lunch, snacks,and drinks. You will need your own backpack and canteen/water bottle. A small day pack will usually suffice. For backpacking adventures, you will need to provide your own backpack, sleeping bag, and eating utensils. We will provide guides, tents, and meals for the trip. A packing list will be provided prior to the beginning of the trip. 50% non-refundable (but transferrable) deposit to reserve the space and date. Balance due the first day of the tour. We would like a minimum of a month to schedule your adventure, but we will do our best to accommodate everyone! 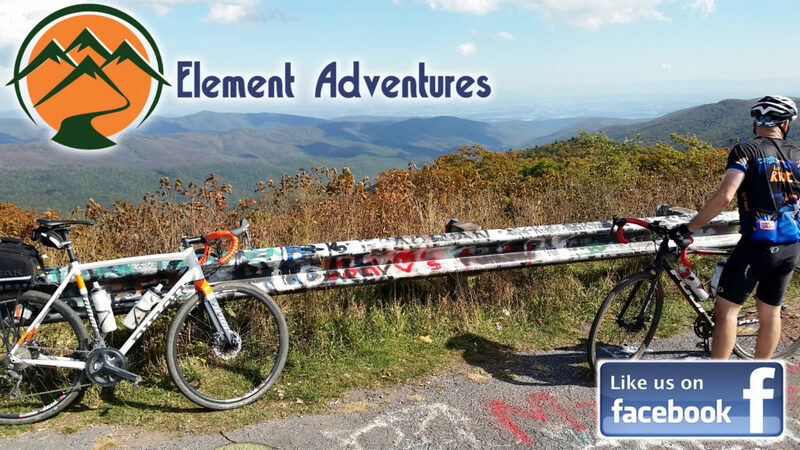 “From climbing up a gravel road to the top of Reddish Knob, to careening down rocky singletrack at Elizabeth Furnace, or soaking in the sun and fresh air on Skyline Drive, I’ve done every sort of ride imaginable with Element Adventures. Proprietor Josh Lewis is full of encouragement and a positive attitude, even if you’re backtracking several miles to find a dropped water bottle, and he seems to know every gravel road, remote trail, and supply stop for hundreds of miles around. An absolute blast will be had on every single adventure.“ — Dave E.
“Having done a number of large rides (mountain bike rides) and a one day tour (road ride) with Element Adventures I can tell you that they are able to accommodate riders of all levels through providing self support to full supported rides. They now the local area very well and help you bring out your strongest ride. A few of the other riders I was with also took full advantage of Elements Adventures shop services of receiving, assembling, and prepare their bike for the tour. They are also capable of packing up and shipping your bike back to you as well. One of the unique advantages of riding in the Appalachian area (where Element Adventures is based) is that there are all type of roads and trails to ride on. Most of them are not busy with other riders or cars making it feel more special. Also the Appalachian area is heavily wooded meaning that there is good tree cover most of the year keeping the heat down. Give them a call if you are looking for something particular, that is what I did.“ — Dan P.
Schedule your Element Adventure today!